1. Love better. This year I want to love well and empathize more. I want to hear others' perspectives, and care about what makes us different and what makes us alike. I want to love beyond fear or doubt or insecurity. 2. Give more. Kyle and I have a goal to always give away as much or more than we did the year before. 3. Be kinder to myself. I like to attain goals; it's ingrained in who I am. 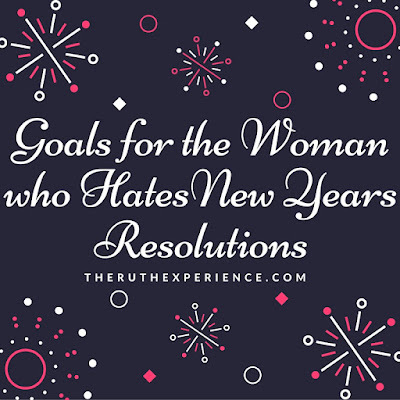 I've realized this year how, in pursuit of those goals, the unkind way in which I talk to myself at times. I tell myself things I would never say to someone else ("why can't you just lose these last 10 pounds already?!?"). It's time to stop being so mean to myself. 4. Be kinder to those around me. In the same thread as speaking more kindly to myself, I realize that I need to do a better job of speaking kindly to those around me, especially my husband and kids. 6. Play more. It's no secret that I love lists and schedules, but I also see the value of adding play into my day. This has become more apparent as my kids get older, as some of my favorite memories this year are from times when we were doing something together -- biking, mountain climbing, cross country skiing. They're activities that we still reminisce about months later. 7. Pray more. I'm getting better at this, I really am, but I can always improve at turning to God before trying to solve things for myself or worry about things I have no control over. 8. Rest without guilt. It's time to stop thinking that I have to have everything crossed off my list (again with the lists!) to take a rest. Sometimes rest is just what someone needs to complete everything there is to do. 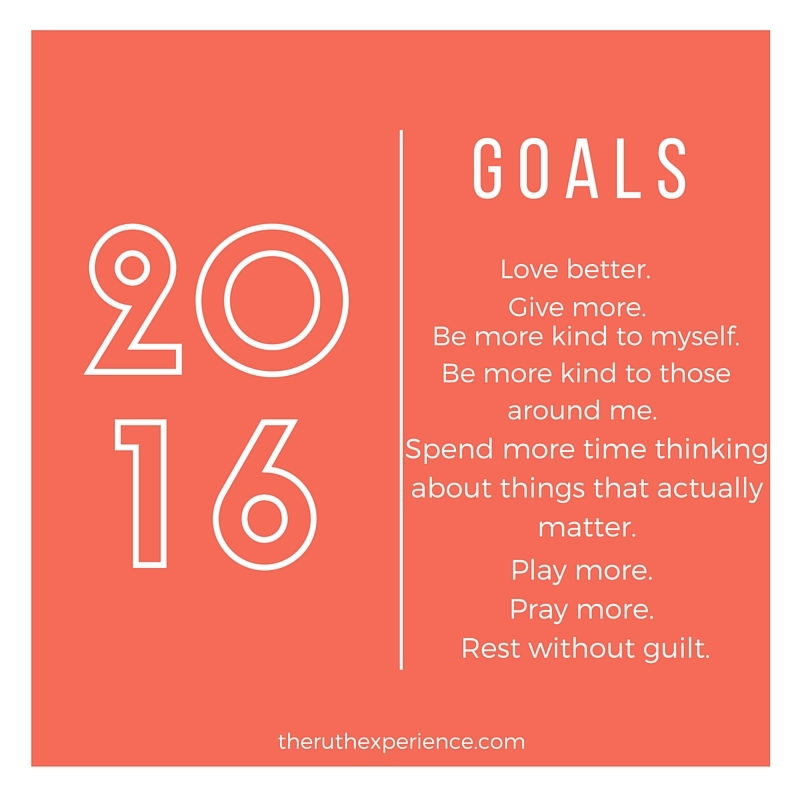 So there it is, my goals for the year. Are some of them lofty? Probably. Unattainable? Maybe. But if I am able to move a little bit further towards these eight things in this coming year, I will be content with that. Perfection isn't the goal this year, improvement is my aim. 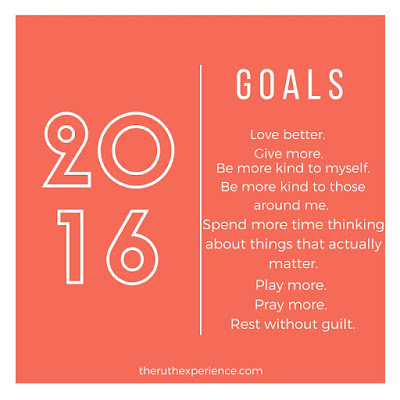 So now I want to hear from you, what are your goals for 2016? I especially like #3! My goal for 2016 - lean more on Jesus and less on me. 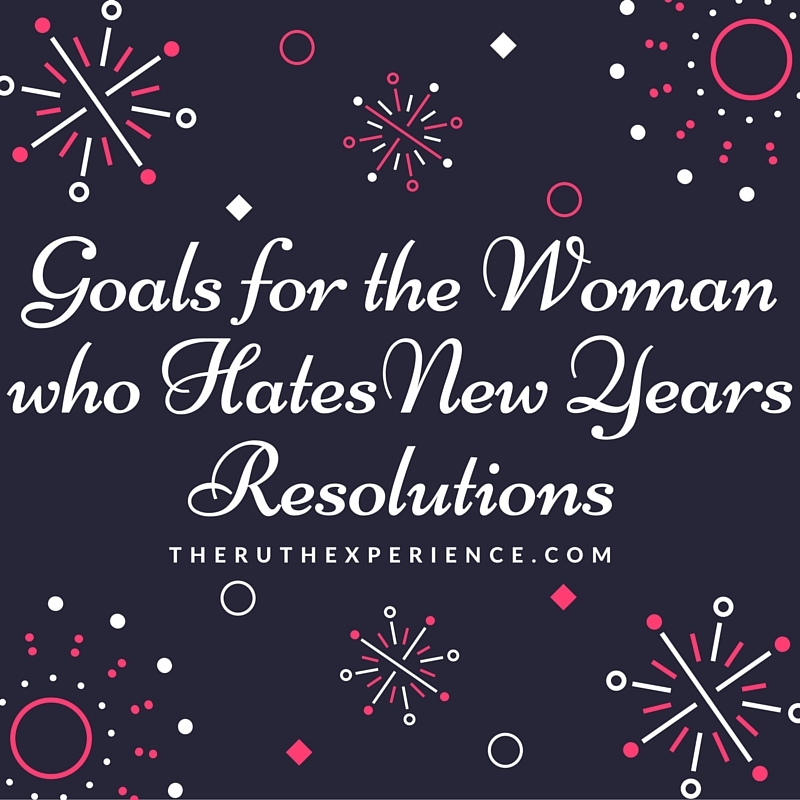 Because I always make weight resolutions and then beat myself up about them (see #3 right? ), this year, I decided to focus on a different part of my body. The teeth! I used my Kohl's cash I "earned" while Christmas shopping and bought myself one of those fancy waterpik toothbrush/flossing systems and am going to have better teeth this year....and like you and Kyle, we're going to work on #2 as well. I always go well with it until about summertime and then I fall off the wagon. I need to give all year long. Holly, I love this! Teeth are important too! Giving is something that you definitely have to be intentional about, otherwise it's easy to let it go without even realizing it. Good luck! !